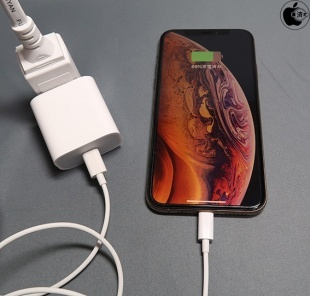 Japanese blog Mac Otakara posted a new report tonight which indicates that Apple will maintain the Lightning connector on the 2019 iPhones but may finally be including an 18W Fast Charger and USB-C to Lightning cable. The inclusion would represent an upgrade to the currently shipping 5W USB adapter. The 18W adapter allows fast charging with iPhone X charging from 1 percent to 79 percent in one hour. This rumor actually contradicts a previous report by the same site which expected Apple to retain the 5W adapter. Mac Otakara also reiterates Ming-Chi Kuo's claim that this year's iPhones will have the ability to wirelessly charge other devices. I guess Tim Cook finally ran out of his stockpile of 5W chargers! Ah, the monthly Lightning / USB-C rumors. That time of the month already. The inclusion would represent an upgrade to the currently shipping 5W USB adapter. Plot twist: The iPhone XI once again includes the 5W charger and Apple allows customers to buy an 18W charger at full price. WHY just WHYYYY Apple is fragmenting so much of its products? Why clinging on to Lightning if iPad Pro was getting a USB-C anyway? Latest iPad Pro isn't that much different from 10.5" I bought in 2017. It is shinier, faster, and less bezels sure. But it isn't much more pro than then one I already have. My iPad also has the same 8000mAh battery even though it's still Lighning port. Power sharing can also be done via Lightning, if Apple allows it to. This lineups are confusing for most. Travellers must deal with USB-A, USB-C, Lightning cables and their combos in between, because of this fragmentation, WHYYYY??? Please don't become the Android manufacturers we desperately try to avoid. Consolidate and think hard, what do you want Apple? Sticking with Lightning, or moving on to USB-C? Pick a side already!! Needs to come with 128 gig base too. Is there anything preventing the next iPhones from adopting USB-C? If they think headphone ports should be obsolete, they should consider making the lightning port obsolete as well. It just doesn't make sense to have more than one type of port on any device, ever. Also, when it comes to headphones, if they think people should adopt wireless headphones, they should make a pair that prioritizes sound quality above all, none of this Beats crap. Umm, 2019 iPhones had better include a USB-C to USB-C cable. Because 2019 iPhones should have USB-C. Lightning is inconvenient, antiquated, and has got to go! It shouldn't be news because Apple should have gone to 18W chargers with the iPhone 8 / iPhone X, much less the XS / XR. It's gonna take more than that to goose sales in China where Huawei is eating Apple's breakfast, lunch, and dinner (84% market share drops to 56% in 1 year). Apple has never had 84% market share in ANY country, let alone China. Someone needs to double check their numbers lol.